The Centers for Medicare & Medicaid Services (CMS) publishes the Provider Utilization and Payment Data: Referring Durable Medical Equipment, Prosthetics, Orthotics and Supplies (DMEPOS) Public Use File referred here as “Referring Provider DMEPOS PUF” in efforts to make the healthcare system more transparent, affordable, and accountable. 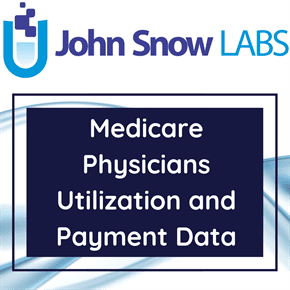 The dataset gives information on the utilization, payment (allowed amount and Medicare payment), and submitted charges organized by National Provider Identifier (NPI), Healthcare Common Procedure Coding System (HCPCS) code of DMEPOS products and services provided to Medicare beneficiaries as ordered by physicians and other healthcare professionals. The dataset is enriched with latitude and longitude for the providers. This Public Use File is based on information from CMS administrative claims data for Medicare beneficiaries enrolled in the fee-for-service program available from the CMS Chronic Condition Data Warehouse. The data set identifies individual providers who referred DMEPOS specific services using their National Provider Identifier (NPI). The Referring Provider DMEPOS PUF data allow for many types of analyses to be performed, including, for example, summary analyses by provider specialty. These new data include information on 385,915 referring providers, over 100 million claims, and $11 billion in Medicare allowed payments for 2013. Internal Medicine and Family Practice are the largest referring specialties with more than 80,000 unique providers in each specialty prescribing DMEPOS products. These providers refer an average of 36 and 38 DMEPOS products, respectively, and make referrals to a higher number of DMEPOS suppliers than most other common specialties. Some examples include wheelchairs, walkers, oxygen supplies, nebulizers, and diabetes testing supplies, as wells as other products such as enteral/parenteral nutrition, inhalation solutions, and certain chemotherapy drugs. Cardiology and Urology specialists refer fewer unique products and have fewer unique suppliers. Additionally, the data show that allowed amounts for referred DMEPOS products vary among these specialty types, from a low of $12K for Physician Assistants to a high of $156K for Pulmonary Disease specialists (likely due to the large amount of oxygen and nebulizer supplies prescribed by these specialists). The DMEPOS data can be used for geographic comparisons of costs and utilization of DMEPOS services/products and when combined with data on the number of beneficiaries enrolled in Medicare Part B coverage, per capita averages can be calculated. Nationally, the per capita allowed amount for all DMEPOS was $343.70 per enrolled beneficiary. These data include information for common inpatient and outpatient services, all physician and other supplier procedures and services, and all Part D prescriptions. Providers determine what they will charge for items, services, and procedures provided to patients and these charges are the amount that providers bill for an item, service, or procedure. The data in the Referring Provider DMEPOS PUF covers calendar year 2013 and contains final-action Part B non-institutional DMEPOS line items for the Medicare fee-for-service (FFS) population.